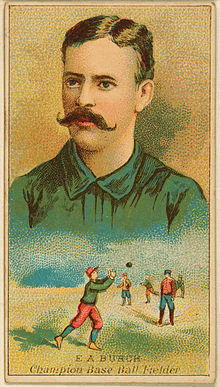 I had to find out after running into an 1887 Old Judge Baseball card of this former Brooklyn Grays/Dodgers left fielder. It had recently sold at Bagger's Auction for $95.00. 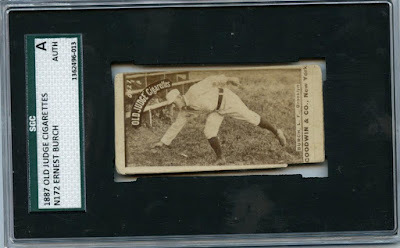 The card, as you can see above, shows Ernie sprawling for an imaginary ball next to the wooden stands built upon the bank of old Washington Park stadium on 4th and 5th Avenue's in Brooklyn. He's sporting a fantastic uniform complete with pillbox cap, collared jersey with laces for buttons and what must have been a stylish-for-time mustache that would make hipster's of today green with envy. This man was the picture of late 19th Century awesomeness, and as such is deserving of a brief spotlight some 120 years later. Unfortunately, information is scant, so I'll do my best. Ernie Burch began playing professionally a bit late in life (although, this was rather common during these days) at the age if 26. Originally from Illinois, he started out for a club called the Peoria Reds of the Northwestern League before moving on to the Cleveland Blues of the National League in 1884. He failed to impress while there; slashing just .210/.240/.242/.482 in 124 at-bats. The next year, though, he broke out and caught the eye of Brooklyn scouts who signed him up to play in the borough for the 1886 season. His first season for the Gray's he hit .261/.321/.349/.669 then .293/.395/.388/.784 in 1887. Then, he all but disappeared from the Majors. Why? I dunno. ''Burch is regarded as a fine fellow by those who know him,'' it was written. ''But fine fellows do not always make fine players. I am told that this is especially true in Burch's case. Mike Scanlon told me that Burch is not the fielder and batter he is cracked up to be and Mike wonders at the avidity with which the local clubs sought to secure Burch's services." So, he flamed out. Such is life I suppose. One day you're the peach to the pie... the luster to the gem... the vibrato to the fiddle. Then the next you're like that first round draft pick that never got past double-AA. BTW, I did discover while briefly researching Burch that there is a famous Ringling Bros. & Barnum and Bailey Circus clown with the same name. He performed under the name of Blinko the Clown and was featured in a Cecil B. DeMille film in 1951 called "The Greatest Show on Earth." He was even honored by colleagues as the King of the White-Face Clowns, and worked at Circus Circus in Las Vegas from 1977 to 1990.